As one could expect, the Ohio State yearbook is a treasure trove of college football history. The Makio details life on the campus of the Ohio State University. It is a vast digital collection of yearbooks dating all the back to 1880. By and large the football game writeups are spotty. Within these pages, a lot of words are spent on Ohio State victory, but not much is made of its defeats. This same sort of revisionism is evident in the collection at large - leaving out the edition with perhaps the most interesting story for those of us who don't particularly like Ohio State. I don't know why Ohio State University Archives doesn't include the 1979 edition. I do know they skipped the yearbooks of 1881 and 1893 as well, but other than these three years all other Makio yearbooks from 1880 until 2012 are included in the digitized collection. 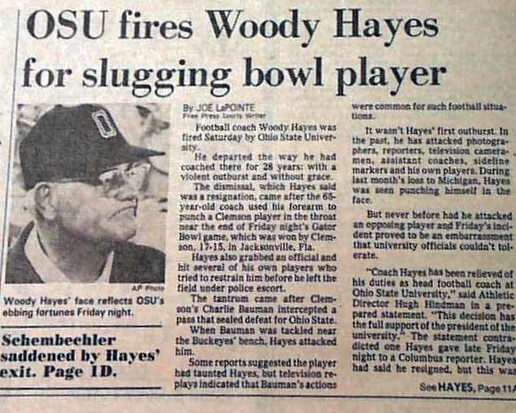 It could have something to do with the 1978 firing of disgraced Ohio State coach Woody Hayes, but I really don't know if there was any ulterior motive in leaving 1979 out of the public digital archive. That type of press can be expected from the yearbook editors of such great football schools. Far greater universities, with far superior football teams have produced yearbook accounts that bask in their own glory at the cost of journalistic objectivity. That's what is fun about following the histories of college football through university yearbooks: you're being invited to experience the perspective of the fans themselves. The thing with OSU is that - since 1932 - its football has been great enough to foster this type of fandom - which subjects more than half of these yearbooks to eye-roll inducing levels of homerdom. Pitt came in knowing about the new threat to their west. At this point West Virginia and Penn State annually tested out as below the caliber of the Panthers, but the OSU program was taking off under their head coach Francis Schmidt. At this point Ohio Stadium hosted crowds upward of 70,000 spectators and were becoming a legitimate threat to the Panthers gridiron supremacy. Pitt faced Ohio State in classic Columbus October weather and the game was played in a Horseshoe full of mud. Pitt, coached by Panther great Jock Sutherland ran a single-wing attack and only led for 5 minutes at the very end of the game. Ohio State's defense remained stout, but the Buckeyes only crossed midfield one time in the game. Pittsburgh's lone touchdown was a direct-snap sweep run by halfback Curly Stebbins, and Pitt squeaked out the victory 6 to 0. Pitt outgained OSU on the ground 251 yards to just 77, and doubled up Ohio State's number of first downs 11 to 5. Pitt went on that year to win the Lambert trophy, the Rose Bowl and multiple selections as 1936 (pre-AP) national champions. The 1936 Buckeyes were a young team and within 6 years the program would climb the mountain for the first of its 8 national titles. 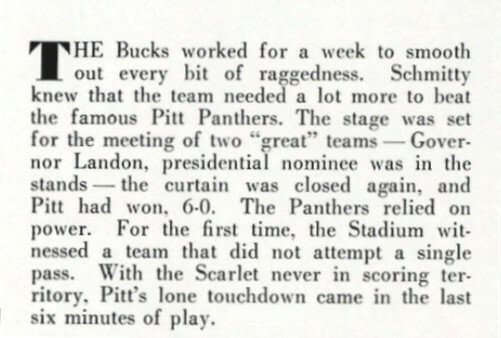 By 1942 Ohio State, surely aided by Pitt's de-emphasis of football, completely supplanted the Panthers as the premier team from the midwest/northeast. As 1942 was Ohio State's first title out of 8 - this year 1936 was Pitt's second to last of that golden era. The Panthers claimed 1937 title and didn't win another title for another 40 years. Ohio State's past is full of great players, historic games and legendary icons. In the Makio, you should be able to find most of the relevant history on these names and games. If you crave non-football items from Ohio State you can check out items like the 1927 yearbook which details Ohio State's homecoming queen, which was an actual cow. Try the search feature; (I found it a bit clunky, and not too user friendly), you can explore the splendor of Ohio State's campus of check out the sights from around the great city of Columbus. Army has their game notes up here (.pdf). Here's what grabbed my attention from the first page. The Black Knights have yet to give up points in the second half through two games and have outscored their opponents 44-0 following halftime. Ohio State's game notes can be found here (.pdf). (Ohio State coach Urban Meyer's) TEAMS RECOVER. QUICKLY. Urban Meyer’s teams, covering 196 games, have regrouped, recovered and gotten backto winning quickly after a loss. His teams have lost consecutive games only four times in 15-plus seasons and he has had just one three-game losing streak. His last back-to-back losses: at the end of the 2013 season to Michigan State and Clemson. That's a heck of a time to lose a pair of games. Army persevered in the second half and put together one full half of winning football to defeat a game Buffalo Bulls squad. The only thing it could the game could have done more to reminded me of last year's game was to go to Overtime. This was really Army's first full game, instead of playing 86 players Army needed their best available 22 down the stretch. It was likewise the first time Army found themselves in a serious hole this year. This game was timely reminder that one little penalty can just derail the whole system. In the first quarter it was a 15 yarder on 1st down that put the Cadets behind schedule and then, soon after punting, behind on the scoreboard as well. Army took a chance on their next possession, now down 7 to 10... 4th and 2....Army on the Buffalo 35 yard line. Well, the offbeat call would be to take a shot downfield, and offbeat is what they went for. Bradshaw's pass sailed long, missing a wide open receiver. I'm going to disagree with that call every single time. I get trying to scheme yourself into advantageous situations, but it's early in the 2nd quarter, Army is down 3 points and the offense had the chance to finally get into a groove with a bread and butter 2 yard run. I don't know what their internal calculus was on that call. On one hand, Buffalo had just stuffed two runs for a yard each in this set of downs - on the other hand Army averaged 6.66 yards per carry at that point. Whatever the outcome, TD or turnover, maybe a shot down the field right there was just enough to quiet down those who think Army needs to pass more. Army threw 9 passes, three of those were for being behind schedule - 3rd and long or backed up due to penalties. Five of the passes were taking a shot on early downs, and one was the 4th and 2 heave through the uprights. The thing is, once Army got the passing out of their system they were able to run the ball and stay ahead of down/distance trouble - and play their way back into the game. Buffalo played very well on defense. There were a couple of big plays for Army, but in terms of playing the option they did an exceptional job. Last year Army played their 4th game of the year at Buffalo, so realistically there was no chance to hold any of the playbook back from the Bulls this time around. Lance Leipold, for all the growing pains he's enduring coaching at the D1 level, played pretty solid X's and O's in this one. There were some mismanaged downs, the end of the half without throwing the deep ball one more time - that's how UB got all their points - off of the long bomb or a missed assignment. I think you at least have to chuck it up in that spot. The only downside I can imagine is Army getting pressure on the pass and hitting Jackson during that long wind-up and by throwing it there maybe Leipold saw a risk of letting up some cheap points there at the half. You want to talk about great coaching? You need not look farther than Army OC Brent Davis. When Ahmad Bradshaw tore off that 52 yard scamper to set up Army's first points it was clear Army knew they needed to open the playbook up a little bit. At first I thought it was something out of Paul Pasqualoni's freeze option scheme, but I looked at it again and it was just a perfectly blocked QB counter sweep. That was the second time all year Army pulled an interior lineman and the first time they pulled linemen to block misdirection at the point of attack, and it was flawlessly executed. To be able to pull that level of orchestration out of your pocket this early in the season - for a one off play. It tells me they have some good stuff in store for upcoming opponents and I, for one, should worry less about Army showing pages out of their playbook. Here are the Buffalo/Army story, stats and highlights.